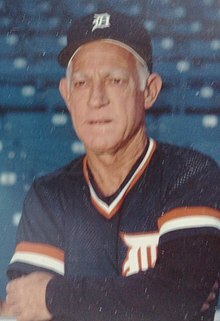 Sparky Anderson (22 Feb 1934 - 4 Nov 2010) was a baseball manager, born as George Lee Anderson in Bridgewater, South Dakota. He managed the Cincinnati Reds and the Detroit Tigers. He was voted into the Baseball Hall of Fame in 2000. ↑ "Anderson, Sparky (1934-2010), baseball manager - American National Biography". www.anb.org. ↑ "Sparky Anderson". Baseball Hall of Fame.